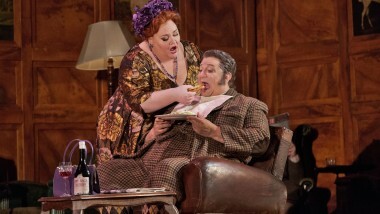 Director Robert Carsen‘s staging is a new take on Verdi’s final masterwork — it’s Falstaff as a 1950’s sitcom filled with wine, women, and song, and food (lots of food! ), love and laughter. Ambrogio Maestri sings the iconic basso buffo role of Sir John Falstaff, the boorish, blustery character in Shakespeare’s Henry IV and The Merry Wives of Windsor. Angela Meade is Alice Ford, one of many objects of Falstaff’s affection, and Stephanie Blythe is Mistress Quickly in a cast that also includes Lisette Oropesa as Nannetta, Jennifer Johnson Cano as Meg Page, Paolo Fanale in his Met debut as Fenton, and Franco Vassallo as Ford. James Levine has led an unparalleled 2,456 Met performances over the course of his 42-year Met career, including 55 performances of Falstaff, more than any other conductor in company history. Falstaff was originally seen live in movie theaters on December 14, 2013, as part of the groundbreaking The Met: Live in HD series, which transmits live performances to more than 2,000 movie theaters and performing arts centers in 65 countries around the world. Throughout its 40 year history on public television, Great Performances has provided viewers across the country with an unparalleled showcase of the best in all genres of the performing arts, serving as America’s most prestigious and enduring broadcaster of cultural programming. Now in its fifth decade, the series has been the home to the greatest artists in the areas of drama, dance, musical theater, classical and popular music, providing many with their very first television exposure. Corporate support for Great Performances at the Met is provided by Toll Brothers, America’s luxury home builder®. Additional funding is provided by the National Endowment for the Arts. This Great Performances presentation is funded by the Irene Diamond Fund, the Anna-Maria and Stephen Kellen Arts Fund, The Philip and Janice Levin Foundation, The Agnes Varis Trust, and public television viewers. For the Met, Gary Halvorson directs the telecast. Jay David Saks is Music Producer, Mia Bongiovanni and Elena Park are Supervising Producers, and Louisa Briccetti and Victoria Warivonchik are Producers. Peter Gelb is Executive Producer. For Great Performances, Bill O’Donnell is Series Producer; David Horn is Executive Producer.